Our recent quest to find a publisher has finally paid off. After spending a few weeks checking out different publishers and myriad publishing options, Chris Coyier and I have decided to go the DIY-route and publish the book ourselves as a PDF. 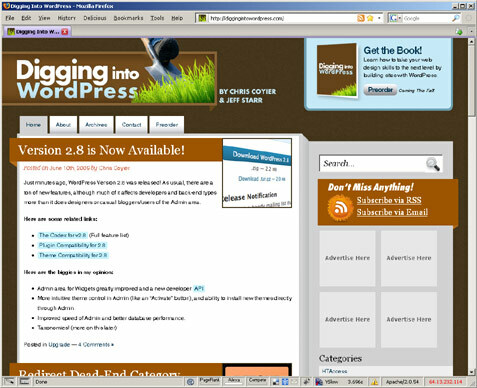 The book is titled “Digging into WordPress,” and is due out late Summer or early Fall of this year. It’s going to be packed full of juicy WordPress goodness and I hope that you check it out when it’s released. The site is still a little rough around around the edges, but we wanted to get things started and begin sharing some sweet WordPress tips and tricks while the book is being developed. Chris and I are both excited to have an exclusive outlet for sharing all things WordPress, so if you are interested be sure to check it out and grab the feed! I will still be posting WordPress-related articles and information here at Perishable Press, but a majority of my WordPress content will now be pumped directly into DigWP.com. I am absolutely thrilled to have this opportunity to work with Chris, and plan on making the most of it by pouring as much WordPress and web-development knowledge as possible into the new DigWP site, and of course the book as well. The book will feature a thorough exploration of WordPress, including many topics that appear on the site. By purchasing the Digging into WordPress book, you will essentially be getting a lifetime subscription to the PDF, which we intend to continually improve and update with new information, tips and techniques. To ensure that you are the first to know about the book, you can add your email here for an early announcement and exclusive pre-launch discount. Read more about the launch of DigWP.com at Chris’ CSS Tricks, and make sure to check out the site itself at DigWP.com. Please drop by the new site, say hello and tell us what you would like to see at DiW!